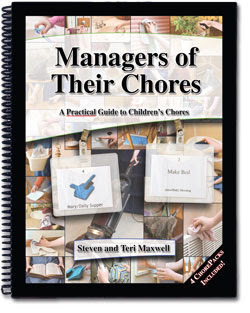 This Beautiful Grace: Mommy Monday :: "Managers of their Chores"
Mommy Monday :: "Managers of their Chores"
This book is from the same website and family who wrote the book I talked about last week (Managers of Their Homes). I did not read this book cover to cover, but used it more as a reference & idea guide. I also enjoyed the online software available to book owners. We already had a simple chore system in place, incorporating Dave Ramsey's budgeting suggestions for kids. Most Saturdays (except when I can't oversee it), the kids do weekly chores. They do work on other days, but for Saturdays they have 5 basic chores. Then they get paid $5.00 commission. The have envelopes to budget their income....$2 savings, $2 spending, $1 tithe/giving. I do NOT agonize over these chores. I keep them short and sweet and I do not pick the kids to death. There are some basic guidelines, like you have to put your cleaning supplies and rags away when you're done, but I have kept it very light and even the tiniest hint of fun. There is no white-glove inspection, but ongoing training and suggestions. (But if you whine, you don't get commission for that chore.) Sometimes I even have to make Karissa (5 yrs) stop cleaning and move on to the next chore or she'll keep going. Last time, she was mopping the bathroom floor. I found her some time later in my bedroom (attached to the bathroom). She was mopping my floor too, and had pulled back the rug and was mopping under the rug! I had to make her stop. What a strange child. Sometimes she'll scrub and scrub until I make her stop. Anyway...I got some good tips from this book to refine our process and to help me when I feel it is time to expand their chores. The coolest thing from this book is the chore pack. Included with the book are plastic name-tag-type thingys that have a clip. You print out core cards and put them in the pocket. They clip the chore pack on their clothes and work through their chores one at a time until the chore pack is completed. My kids are so young, I actually have them put the chore card in our chore basket when they finish it. This keeps it clear where they are in their chore process and I can check on what chores they have finished. Caiden (3 yrs) even got a chore pack and handled it well (except for sheepishly losing his laundry chore card). His chores are a little different because he is home with me each morning. His daily "spider man chore" (as he calls it in a deep, brave voice) is to gather the laundry in the morning and bring it to the basement stairs so that I can grab it and go when I'm ready for that part of my schedule. Sometimes it's a little too heavy and he has to have help. Sometimes he cheats and only gets half the laundry and I have to take him back to be thorough. But it just gives my mommy heart the strangest little tingly thrill to see him pulling that laundry to its place by the fridge. Okay. So my major advice about chores/commissions is this: Keep it Simple, Stupid! I tried doing the Dave Ramsey chore system earlier and was trying to get by cheap with quarters or something (don't remember exactly). But I remember that it shot itself in the foot because it wasn't dirt simple. If it's simple, you can stick with it. If it's complicated, everyone will hate it. Especially you. My goal is not to have 3, 5, and 7-year old kids who can win a cleaning competition. I'm trying to train MYSELF to be consistent and get them used to the fact that they are valuable contributors to our home. Some chores they do simply because they live here, by the way. They don't get commissions every time they blow their nose. Just those 5 chores. I keep the chores simple enough that they don't dread them. I feel this is extremely important at this age. At these ages, I would rather do some of my own spiffing after they're done (and not watching) than make them feel like they never-ever do it good enough to please mom. My general guideline is that I want them to spend at least 5 minutes per chore. We use timers a lot around here. When they dust, I don't make them move a million things and dust nooks and crannies. Then can even use a feather duster if they choose (but they much prefer rag-spraying). Then, as the grand finale, their 5th chore is usually laundry. They look forward to this one because they get to sit on my bed and watch a video together while they fold. So there it is. The book is a massive resource for chore-building. Everything you ever could want to know about chores-training is in here. It's a little more than we need right now, to be honest. But it is an awesome tool. And I think it is shaping my thinking so that I can grow their chore productivity in a practical way as they mature. Just you wait, in about 10 years I'll head out the door on Saturday mornings for yard saleing or writing at Panera and come home to a sparklingly clean house and glimmering children. (Did I mention there were opiates hidden in the pages of this book?) Yes, I know. They'll be teenagers then and they probably won't even be home on Saturdays!